Large damask travel tote bag. Move seamlessly through summer, winter, spring and fall with a timeless design that will suit all seasons. The Damask pattern has been passed down through the ages, symbolizing a rich, luxurious heritage that is still appreciated in today’s modern world. Super striking in black and white, this intricate and detailed pattern will have you looking twice! Use it as a day tote, an evening tote, a beach bag, a shopping spree bag or a carry-all for the kids clothes and toys. Easy to carry with two long handles, it is perfect for the lady who demands style all year round. 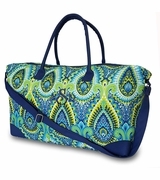 The damask travel tote bag measures 24.5"W x 16.5"H. Double handles and cotton lining. Large open tote.